Having a vintage pick-up truck as a stout and versatile street machine is one of the cooler ambitions that any enthusiast can have. But it is important to remember that the suspension requirements of a high performance street-fighter are far removed from those of the barely civilized farm equipment of the late 1950s. 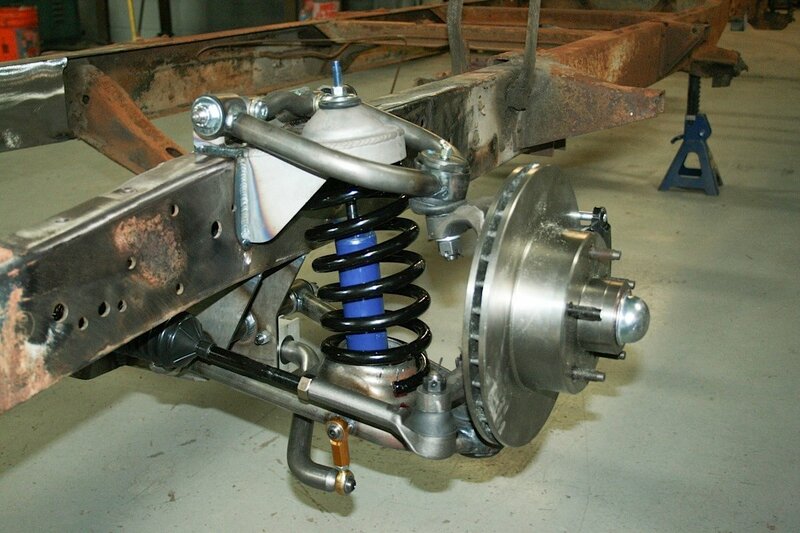 To help bridge that gap, Total Cost Involved Engineering produces a complete independent front suspension kit to upgrade the steering, braking and handling of the 1955-59 Chevrolet Pick-up. And as you can see in the video above, making this upgrade easier than you may think! Todd Walton of Walton Fabrication was tapped to install the suspension upgrade for this project. His years of experience and meticulous attention to detail have garnered him a stellar reputation in the hot rod industry. Jason Wilcox of TCI Engineering was also there to lend a hand. Even the best parts made can only perform as well as they are installed. That’s why if you’re unsure that your particular level of competence and skill is good enough to complete the job at hand properly, it makes sense to look for someone that you can rely on to do the job right the first time. For this installation, the truck’s owner chose Todd Walton of Walton Fabrication in Upland, California. Todd has decades of experience installing TCI’s products and knows exactly what to expect. If you’ve got some fabrication and suspension know-how and you like getting your hands dirty, this kit comes with highly detailed, step-by-step instructions that enable do-it-yourselfers to complete the installation properly. If you have the appropriate tools, facilities and skills, there is no reason you couldn’t do this upgrade yourself. There is not one of us who have ever turned a wrench, pounded sheet metal or created sparks that does not know the importance of having high quality parts to complete the task with. They save you time because they fit properly and they save you headaches because they are reliable. Upon inspection of the kit, it was found to be as complete right down to the necessary hardware. Every nut, bolt, washer and fitting required for this job was accounted for so having to stop your progress to chase down incidental parts is eliminated. It’s always a treat to see real craftsmen at work. As the Chevy truck’s front frame is being prepared for the installation, we can see the care that is going into the job. It takes more than just slapping some steel in place to make this old truck handle like a performance car. Making sure that all the metal is clean and free of debris ensures that problems like rust, metal fatigue and damaged areas don’t come back to bite you down the road. As it shows in this video, precise measurement and leveling are crucial for getting optimum performance from the finished product. The care taken in this step ensures that when the truck is complete it will roll true, the wheels will align properly and it won’t go through tires like fire through paper! After the frame is prepped and welded, its time to measure for the installation. Once the critical points are located and marked, the assembly begins. The installation goes quickly as the suspension, steering and brakes all fit together seamlessly. In no time, this ancient seed hauler becomes capable of keeping the occupants going straight, keeping stable and being safe with the increased horsepower demands that are doubtlessly in the pipeline. Here's a before and after comparison of the suspension upgrade installed. Which one would you rather have controlling the direction of your precious posterior? Paul Lambert is an independent writer who grew up during a time in Southern California car culture when big horsepower and high speed were celebrated above all. He now understands that turning, stopping, appearance and comfort are equal in importance...almost! Paul tries to find something likeable and interesting about anything with wheels and thinks that the people, history, and culture of hot rodding are often as important to the story as the cars and events being featured.